An hour at Arley, both Panniers working trains (5764 & 7714) and 46443 on Footplate Experience. No camera today, as not easy to use right hand for anything fiddly. I’m managing capital letters a bit easier though, and using the mouse with left hand. This entry was posted in Severn Valley Railway on May 31, 2009 by Sharpo. Went to Arley via Bromsgrove, to see the above railtour. I did try some photos by resting the camera on the bridge, but haven’t checked them yet. This entry was posted in Main line on May 30, 2009 by Sharpo. An hour at Arley. 7812 northbound & 5764 southbound. Next southbound was the diesel turn with D8188. 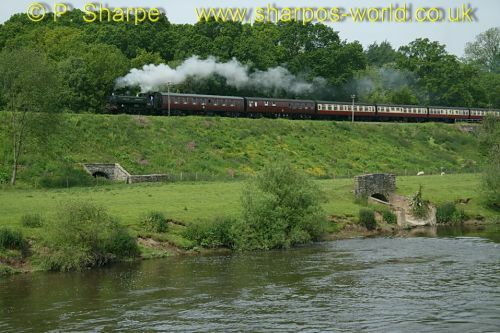 This entry was posted in Severn Valley Railway on May 30, 2009 by Sharpo. 5764 on teaks, 42968 on blood and custards, seen at Bewdley. No photos as I cannot hold camera with arm in plaster! This entry was posted in Severn Valley Railway on May 29, 2009 by Sharpo. Rather messed up my day out, on way up steps on footbridge to photograph 60040, didn’t get shot. Arm in plaster, so not typing very well with left hand. This entry was posted in My uninteresting stuff on May 28, 2009 by Sharpo. Finished the photos eventually. I’m glad I saw those 87s, having missed them the previous week. 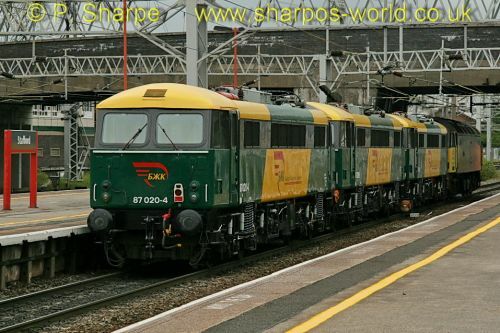 Other photos at Stafford include 66s, (including Eddie the Engine) a 67, 86s, a 90 & a 92. This entry was posted in Sharpo's World Photo Updates on May 27, 2009 by Sharpo. This has kept me busy the last few days – I was one of the people who had problems with the previous security fix. So if anybody runs a Coppermine gallery, get busy and upgrade it! This entry was posted in Computers on May 27, 2009 by Sharpo. Dull but dry, at least it wasn’t the heavy rain forecast for the day. Same as yesterday, except it was the turn of D444, oh, and running to time during the middle of the day when we were out & about. It’s not easy getting “different” photos going to the same area all the time, but we like the sandwiches and cake at the station! This entry was posted in Sharpo's World Photo Updates on May 25, 2009 by Sharpo. Dull, but the forecast was for heavy rain, so mustn’t complain. “We” were running to schedule, as were the trains today. From down by the river, 5764 headed south towards Arley, then after crossing at Arley, 7714 headed north. At the station, 7812 arrived on the “Limited” diner, with D444 on the train for Kidderminster. Finally, before we headed home, 5764 back again on the “Venturer”, crossing with 42968 on a train for Kidderminster. This entry was posted in Severn Valley Railway on May 25, 2009 by Sharpo. Trains delayed by failure of 37906, which was replaced by D1062. Lovely weather though, and the chance for some good shots of passing coaches on the “Limited”. This entry was posted in Computers on May 24, 2009 by Sharpo. 37906 had failed, I believe an 08 had been sent to rescue the train, timetable up the creek! At Arley, 7714 was waiting with a train for Bridgnorth, eventually 5764 came in with a train from Bridgnorth. Next trains to cross were D1062 from Bridgnorth & 7812 from Kidderminster. We waited to see the next trains cross, to find out what the 5th loco was – turned out to be 42968. 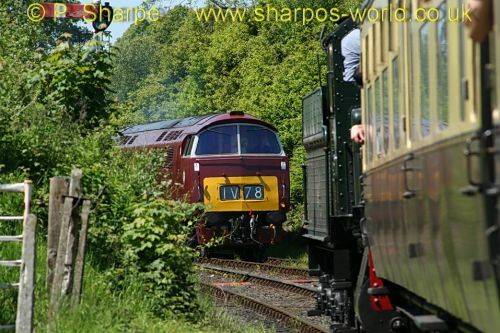 This entry was posted in Severn Valley Railway on May 24, 2009 by Sharpo.